It is no secret that people in Central Oregon love their pets. 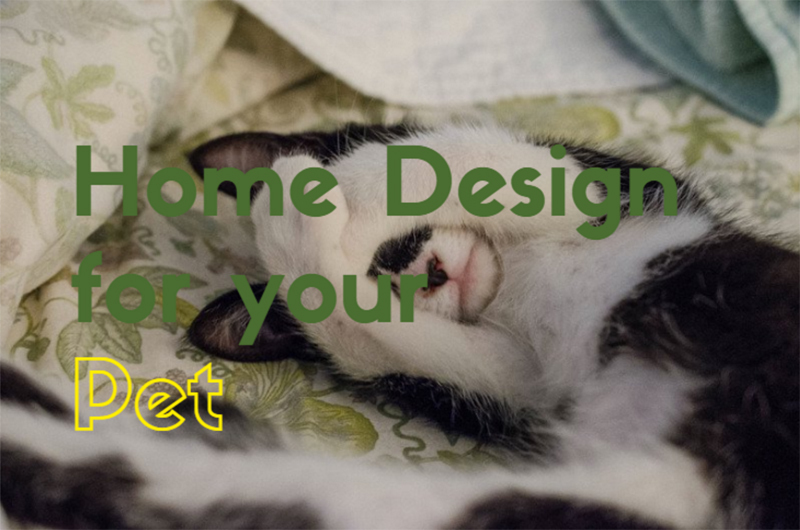 Many people are looking at designing spaces specifically for their pet to enjoy or at least spaces, like entryways, that will be more resistant to the challenges owning a pet can bring. Not all materials however, are pet friendly. What should you consider when designing a friendly space for your furry family member? Here are some things to look for. Hardwood Floors– Almost everyone covets hardwood floors these days. They are the perfect way to add warmth and character to your home, but they can’t always hold up to animal activity. Wood floors can easily be carved by animal claws, even when trimmed regularly, especially if it’s a big dog. Lighter hued wood floors reflect more light which can help to hide imperfections. Distressed wood floors with low sheen work well with animals because they already capitalize on an imperfect look which will disguise some of the damage your beloved pet may cause. Carpet– Carpet can be a good solution for pets as their claws won’t cause any immediately noticeable damage (assuming you are not using a continuous loop) and it can hide animal hair between vacuuming. There are some drawbacks though. Carpet can hold smell and be difficult to clean when your pet has an accident, especially if it the moisture made it down to the pad. Carpet can also stain, although many brands sell with stain resistant materials now. One option may be to choose low pile carpet for the bedrooms and offices and keep other materials in the main areas of the house, especially near entrances. Tile– Tile is hard, resistant to damage and can be easy to replace if one is broken. Tile is a really good option for a doggie bath area or entryway so that if Fido enters the house after an hour of fun in the dirt, he and the surface can easily be wiped down. However, tile can be slippery for an older dog, especially if they have bad hips. Lighter grout can be prone to staining. Ways around these problems can be to get a textured tile, like slate, to add traction. Also, make sure your grout is sealed and continue to do so regularly. A darker color of grout will also help to conceal stains. Laminate Floors– Brands like Pergo market resistance to pet damage which still allows the homeowner the look and feel of hardwood floors. These are a really good option for damage free floors, but again, older dogs do not always fare well with these materials. To help your ageing pet avoid painful falls and difficulty maneuvering, look for more textured and grooved options that will give them traction and add rugs around areas they frequent. When choosing a paint color, take the sheen into consideration. Even the best groomed pets sometimes rub up against the wall leaving a trail; so you will want something that is resistant to some scrubbing. For laundry and bathrooms, you can use a semi-gloss paint that is easy to clean but for main living areas it is better to go with a satin sheen. It’s nice for pets to have a retreat and a space that they can retire to when you are gone or busy, and even a place for easy grooming and clean-up. Having a designated space can help to reduce pet anxiety and improve overall comfort. The space can be any size that fits the dog comfortably, indoor or outdoor (weather permitting), and the space you have available. This can be as simple as adding a dog bed and toys to a quiet corner to having a room entirely dedicated to your pet. 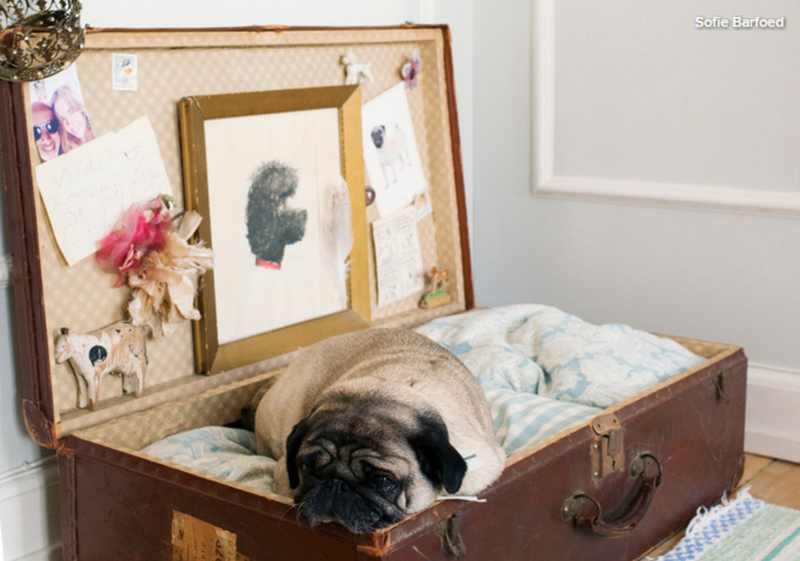 Feel free to get creative with materials you already have, like this little dog from Denmark’s bed made of a suitcase. 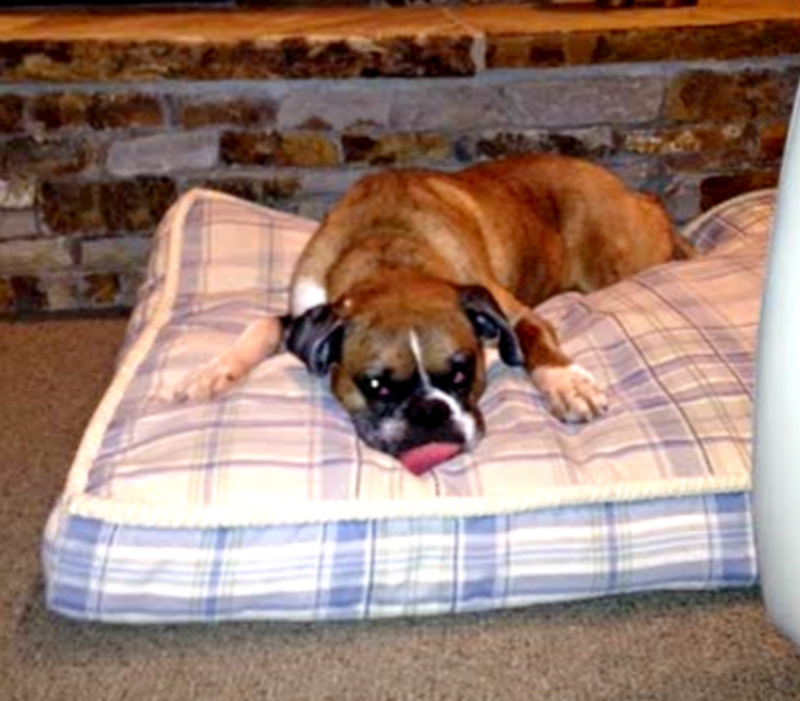 Or go simple with a standard dog bed like this client’s pet, Zeeba, enjoys. As long it is something that is their own. Zeeba has multiple beds around the house so she’s got a special place in whichever room she chooses. It is especially important that your cat feel entertained. Keep a scratching post near furnished areas to keep them from scratching your furniture. If you just can’t get behind a scratching post in your living area, keep it in a more discreet location and choose fabrics like microfiber and leather that cats don’t typically find as attractive. When doing an outdoor space, make sure that the appropriate materials are used to keep the pet safe and contained, and there are no plants that are toxic to your pet. See a list of toxic plants here. If you have a small pet, sometimes an enclosed outdoor space that will protect them from predators will be best. 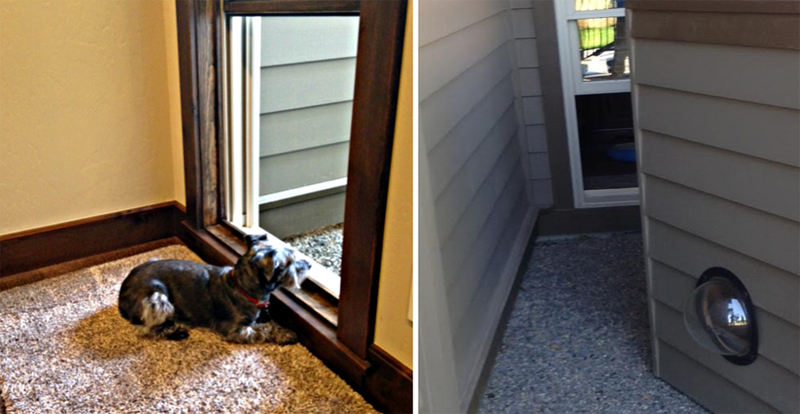 Pictured below is Shadow, another client’s pet, looking out her low window which also serves as a doorway to her “Piddle Parlor” giving the owner a convenient way to provide access to the space by simply opening the window. Shadow even has a window in the outside door of her private space to watch the activity going on around the house exterior. Furniture is one of the first things a person will notice when they enter your home, so you want it to look nice. Look for fabrics that are easy to clean and will not attract animal hair. Soft, lush fabrics like velvet will attract and hold on to animal hair and require a lot of maintenance. Microfiber, especially if scotch-guarded, can resist animal stains and is generally easy to clean. If you choose a material similar in color to your pet it can help disguise pet hair. Patterned fabrics can also help to disguise hair and potential stains. The pictured low double chaise below has pattern which can help to disguise dog hair and is also low enough for an aging or small dog like Bear with little legs to hop on and get comfortable. 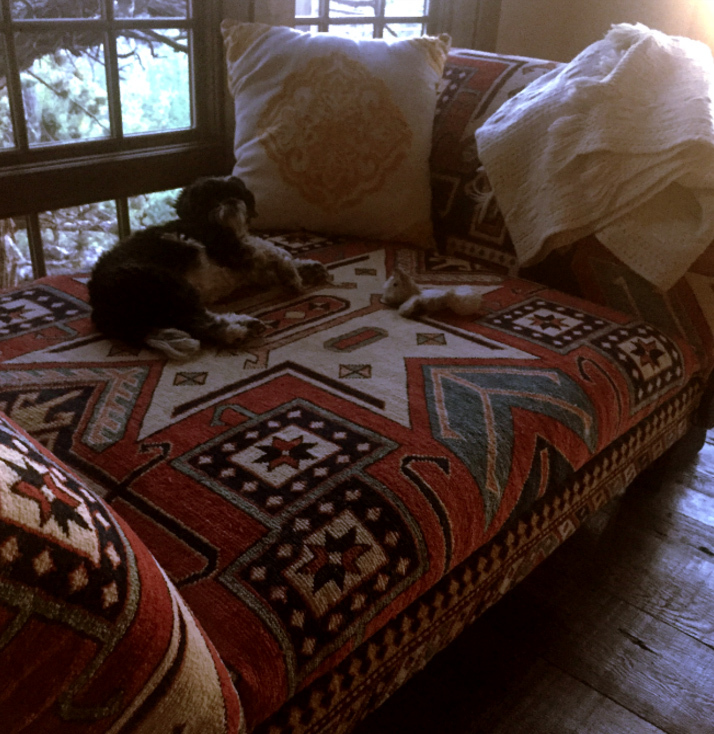 Bear shares the chaise with my clients in their new home. Leather is always a classic. It is easy to clean and resistant to odor. Opt for a distressed finish to disguise marks of wear and tear by pets. Bring outdoor fabrics to the indoors. People are loving that outdoor fabrics are resistant to everyday use and easy to clean since they were already meant to be in harsher environments. If it can hold up to the elements, it can probably hold up to your lovable pet, right? As always with design, be true to yourself and have fun!